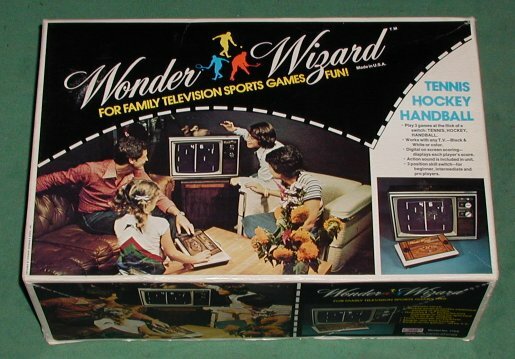 Wonder Wizard and Gulliver were trademarks used by General Home Products for selling video games manufactured by Magnavox. The first game in the line was called Triple Challenge (model 7701) and sold under the Gulliver trademark. 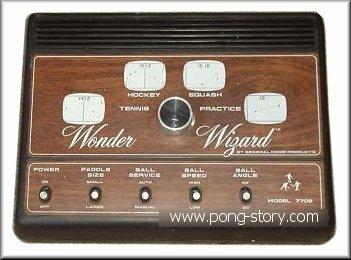 All later models were sold under the Wonder Wizard trademark. One of the most interesting is model 7702. It was sold in 1976 and contains a Magnavox Odyssey 300 circuit board housed into a derivate of the 1972 Odyssey case. The bottom part of the case is identical, only the top differs and was made in two versions: one with silver knobs and woodgrain only in the section containing the "Wonder Wizard" name, and one (as pictured) with black knobs and woodgrain everywhere. 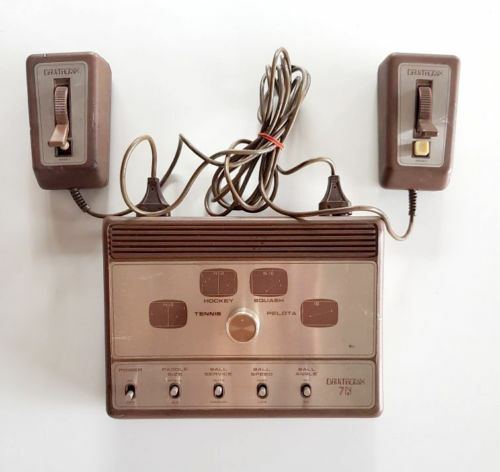 Like Odyssey 300, this system used a 3-position switch to choose one of three predefined combinations of difficulties, avoiding the need to change the ball speed, ball angle and bat size separately. Few systems used this design and most others used individual skill level switches. The Bulls Eye (model 7704) and Sharp Shooter (model 7705) had a rather unique small metal case allowing them to be attached on a side of the TV set. Both used the General Instruments AY-3-8500chip, came with a light gun and played the six games of the chip. The only difference is that Model 7704 played the games in black and white, whereas model 7705 played them in color. The model 7709 apparently closed the line. It was designed in a flat case with a similar decoration as model 7702; it played the six games of the AY-3-8500 chip. Although the picture below indicates that at least a prototype existed for that model, no specimen has been reported so far. However, David Winter rediscovered an almost same model made by Beta Electronic Inc.: the Davitronix model 7N. The story behind these games remains unknown, especially whether Wonder Wizard used a foreign design or even copied it, or vice-versa. The specimen came from Thailand, where it could have been sold. Finally, David Winter discovered an unreleased model in a 1976 sales brochure: Desert Fox (model 7707), a Tank Battle system designed around the General Instruments AY-3-8700 chip. It played four games. Two mysteries remain so far: models 7703 and 7708. No information exists about them, so all rumors are possible, ranging from a different Ball and Paddle chip design to a later design like Breakout, Motocross, etc. Click the pictures below (when possible) for a large scale view. 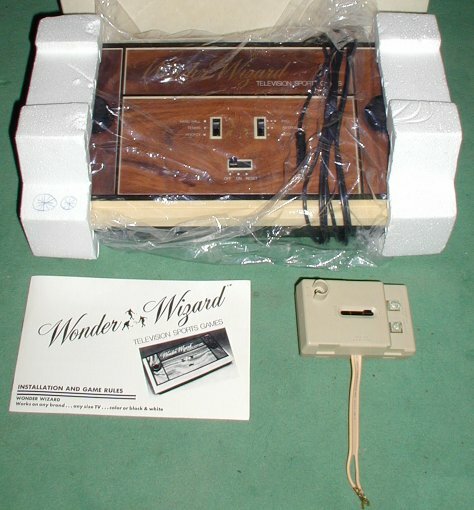 Wonder Wizard 7702 box and console with a nice woodgrain style. Wonder Wizard 7702 in its original packaging. The user manual has the format as the one of the Odyssey 300. The switch box is same as those of the Odyssey 100 to 4000. This is a quite small unit (about nine inches wide). Only models 7702 and 7709 have no name. Davitronix 7N made by Beta Electronic Inc. This clone was rediscovered by David Winter in Aug 2018.